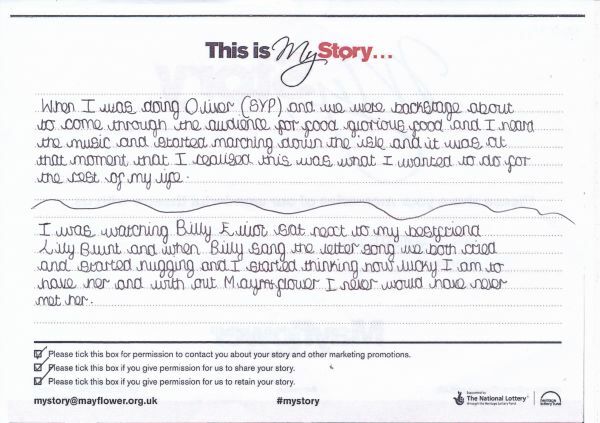 My Story card: Jasmine Berry remembers seeing Billy Elliot with her friend Lily Blunt. When I was doing Oliver (SYP) and we were backstage about to come through the audience for [the song] Food Glorious Food and I heard the music and started marching down the aisle and it was at that moment that I realised this was what I wanted to do for the rest of my life. I was watching Billy Elliot sat next to my bestfriend Lily Blunt and when Billy sang the letter song we both cried and started hugging and I started thinking how lucky I am to have her and with out Mayflower I never would have never met her.